Highland County Senior Citizens member Jackie Noble models on the runway during last year’s Ladies Day Out Fashion Runway Show. 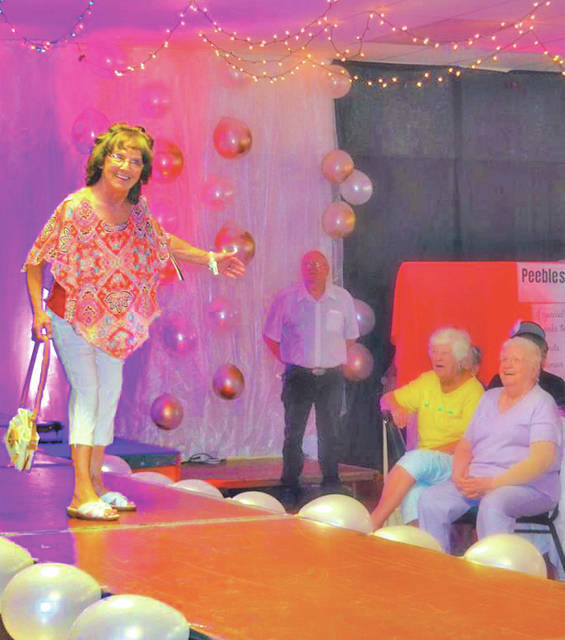 It was new event a year ago and Highland County Senior Citizens Director Mechell Frost said attendees enjoyed it so much that she decided to bring the Ladies Day Out Fashion Runway Show back for a second year. It will be held Wednesday, July 11 at the senior center with the doors opening at 2 p.m.
“It’s just something fun and unique to do in the afternoon, and it’s a fundraiser for the center,” Frost said. Tickets are $20 in advance or $25 at the door, if any remain. They can be purchased at the senior center in Hillsboro from 8 a.m. to 4 p.m. Monday through Friday. “The idea is that when they come in there will be vendors set up with samples, giveaways and products the guests can see. There will be a table of fancy foods like what you’d find at a fine tea party, there will be a runway show after lunch, and there are all kinds of others things they can do and enjoy,” Frost said. She said vendors will include Mary Kay, Avon, Peebles Department Store, Paparazzi Jewelry, Great Clips and possibly more. There will be a classic music/opera singer accompanied on a piano, each attendee will receive a goodie bag, they can have a glamor photo taken of themselves, local resident Lynn Neal will share her collection of Victorian hats, and each guest will receive a ticket for a raffle to win items provided by Peebles, which is also providing the clothing for the runway show, and others. The center is hosting a paper towel drive and Frost said each guest will receive an extra raffle ticket for each roll of paper towels they bring in to donate. There will be other raffles, for an extra fee, of several other items. There will be a 40-foot runway where members of the senior center, plus two children, will model clothing provided by Peebles. Tables for the event will be set up on each side of the runway. Frost said guests can dress in formal wear or as casual as they like. Like several other upcoming events at the center, the fashion show is open to the public. • Breakfast With Santa with the Grinch and Frozen-like Characters on Dec. 1.
https://www.timesgazette.com/wp-content/uploads/sites/33/2018/06/web1_Ladies-Day-pic.jpgHighland County Senior Citizens member Jackie Noble models on the runway during last year’s Ladies Day Out Fashion Runway Show.